Desert-society healers appear to have operated on skulls 2,000 years ago. Talk about getting inside others’ heads. Skulls of three men from North Africa’s ancient Garamantian civilization, which flourished in the Sahara Desert from 3,100 to 1,400 years ago, contain holes and indentations that were made intentionally to treat wounds or for other medical reasons, say anthropologist Efthymia Nikita of the University of Cambridge in England and her colleagues. 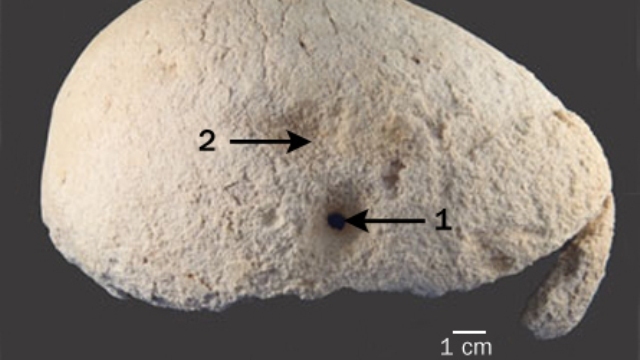 Signs of renewed bone growth around the rims of these cranial openings indicate that the men, who lived roughly 2,000 years ago, survived the surgical procedure, the researchers report in a paper published online August 9 in the International Journal of Osteoarchaeology. Given the evidence of widespread trade networks in North Africa several thousand years ago, “the knowledge of cranial surgical techniques must have been among the cultural traits that spread among populations,” Nikita says. Previously excavated North African sites contain the earliest evidence of scraping, cutting or drilling pieces of bone out of people’s skulls, a practice known as trepanation. Skull surgery occurred as early as 13,000 years ago in what’s now Morocco. Ancient Egyptians performed the technique starting around 4,000 years ago, as did pre-Inca groups living in South America 1,000 years ago (SN Online: 4/25/08). Some modern North African populations have used trepanation to treat headaches following injuries or disease. Nikita’s team examined skeletal remains excavated by other researchers since the 1950s at village sites near the ancient Garamantian capital of Garama in what’s now southwestern Libya. Three adult male skulls contained dime- to quarter-sized holes inside hollowed-out areas, as well as scraped-out depressions. Analysis of this damage rules out disease, bone-chewing animals, accidental falls or intentional blows as causes, the scientists say. Careful placement of fracture-free holes away from sensitive cranial sutures argues against torture or violence as a cause. Reasons for performing trepanation in these ancient cultures remain unclear, although one Saharan skull contains fractures inflicted by a weapon of some kind that may have instigated such cranial surgery.